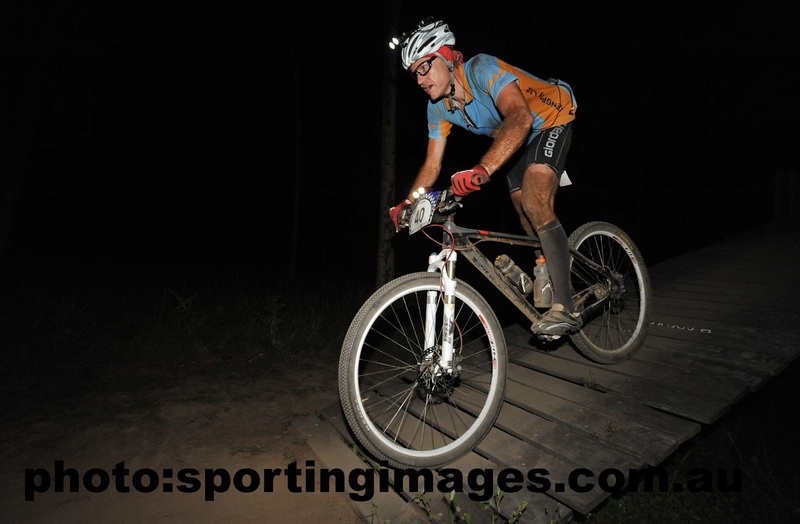 With no 24hr events in Queensland in 2012, it's been nearly 2 years since I last did a 24hr event. The Kona 24hr was my 4th attempt at a 24hr MTB event solo, a discipline I have only ever ridden on a Single Speed. As per usual, it was a small field of only 4 riders, but that was 1 more than my last 24hr and more than some age groups. 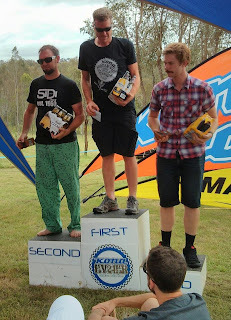 This race was at Spicers Hidden Vale on a slightly longer and more technical version of the 2010 and 2011 24hr races making it a 16.8k lap. The circuit had 2 transitions for the teams, allowing them to do 2 roughly 8k laps. The Easter weekend date meant that we could have a fairly relaxed race preparation. Arriving Friday afternoon and camping the night. My wife and other great friends were in a 4 person team would provide support. One of my main concerns in the week leading up, was what gearing to run. In previous years I have run 32/21, but an "interesting" rule that any spare bike for SS riders must have the same gearing, and the only gearing I have 2 of was 33/21. I knew that would be no problems for 1 or 2 laps, but for 24hrs... On Friday, after setting up camp, Ben, Ali and I went for a test lap. (See video) As I heard a number of times over the weekend, this was a "Real Mountain Bikers" course! It was raw, rocky, technical with enough fun to keep you going out for more, and I was OK with my gearing choice and the weather forecast was looking good, slightly hot, but no major rain forecast. The race was scheduled to start at midday, giving plenty of time to install race numbers, check tyre pressures, lube chains and generally get things ready, and still have enough time to catch up with friends. Part of the action on race day was a 4hr race(starting 5 mins after 24hr) on the full track, and a kids 24min race on a much smaller loop. My eldest boy entered his first MTB race in the kids race, and I was on photographer duties. By the time that raced finished there was less than 1hr until race start. The race start was on the main fire road, and designed to allow for the field to spread out before we entered the first single track, and from what I saw it worked very well. I started towards the front, but behind Larry Dyer in his distinct pink kit who was also riding SS. Thankfully the fire road is slightly uphill which makes it easier for single speeds to keep up with the geared bikes. The start was fast and furious, but I managed to keep Larry in view, and dragging him in ever so slowly, but it was not until towards the end of Aeroplane that I finally managed to pass him and concentrate on just running my own race. The temperature was in the low 30s for first couple of laps and I was trying to keep the fluids up. I was also conscious that this was a long race, and I tried to back off a little from the super fast pace of the first couple of laps. I'd decided on the first lap to take the B-Line switchback up ladder to save the legs from the punishment of the fire trail, even-though I was able to ride it Friday afternoon. With lap times just over an hour, I was starting to think that I would need to carry lights well before it got dark. As I rode in to pits at the end of my 5th lap I thought I heard on the PA, that lights were compulsory, however despite this I did a bottle change and headed back out, but as I approached the pit exit I saw Hayden (probably checking for lights) and I remembered. I headed back to our site and mounted my lights with the assistance of Ali and Ben. I was told I had about a 40 minute lead, which was good news, but with so much of the race remaining no time to sit back and relax. The night laps are my favourite, especially at this time of year when it does not mean ridiculously cold temperatures. For me night riding brings with it a sense of focus. The great thing about an Easter weekend date is that it means a full moon and slightly higher level of ambient light. Sometime early in the night I passed all 3 SS riders. I rode about quarter of a lap with Larry, and we just chatted generally about cycling. About 8 or 9 I stopped for some warm food and a coffee, which gave me a new burst of energy and a change from the muesli bars and bananas. Midnight and we were half way, but I was starting to hurt. My hands, back and feet were the worst, but the fine dust was quite abrasive, and every other part of my body in contact with clothing(including my HR monitor) was getting rubbed raw. My eyes too had been filled with their fair share of dust, but nowhere near as bad as in 2010 where my vision became very cloudy. I was also walking the climb from Ladder as it was as fast as riding the B-line, and the occasional bit of walking felt good for my back. The laps and Ks kept ticking over, but returning to the pits each time to see Ali waiting was like a power boost that gave me the energy to get back out there. I was told all the other SS riders had stopped riding, but my goals were to rack up as many Ks as I was able, and while it was not super cold, the fast descent out of the pits felt much worse after a long stop, so stops were short. My bar light went flat right at the end of one lap, and although I carry spare, my helmet lights were bright enough to make it back safe. The Kookaburra's heralded the approaching dawn, which would also mean there was only about 6 hours to go and no more battery swaps. I was still keeping stops short and plugging away. The fun of riding Rock Bottom, 007, Gully, Western Creek Track and even the first part of Ladder were out weighing the hard slog of Old Man's, Woodworm, the fire road from Ladder and Escalator. The camaraderie of fellow solos and encouragement of team riders all making it worthwhile. On one lap the courteous question of "You right?" to a stopped rider came with the response "No, my chain is stuck!" I decided that I could afford to stop. The chain was stuck between the spokes and cassette and a little brute force and it was all good to go. With about 4 hours to go I had a lead of 5 laps, so I stopped for some more real food, and contemplated my options. I was keen to have a shower, and while there was the off chance that I would need to go out for another lap, I could not relax. After nearly an hour off the bike I decided to guarantee the win and went out for one last lap. I had a gumby stack on Woodworm and was practically picked up and put back on the bike by Matt "Dog" and Sean Bekkers. Nice work mate! Hard course to do on a one speed, got to love Dog and Boz, they always seem to be there when I fall off too! Thanks Hubcap. You had a great race too. Good on you for pushing on when you didn't need to. I kind of wish I did and I would have had a top 5 finish. I will claim 1st in the hard tail category too :) Everyone has a dually these days. Looking at photos of the top 20 there were only 3 hard tails, and they were all SS. 2018 Anthem Advanced Pro 29ER 0 - First thoughts.